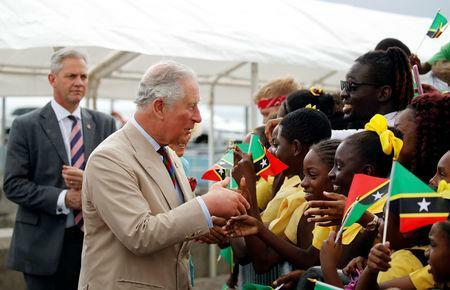 HAVANA (Reuters) - Prince Charles and his wife Camilla arrive in Cuba on Sunday as part of a Caribbean tour, the first British royals to visit the Communist-run nation even as ally the United States seeks to isolate the country. The plans were made before the Trump administration intensified efforts this year to end what it views as Latin America’s “troika of tyranny”: the socialist governments of Venezuela, Nicaragua and Cuba. It has warned foreign companies away from doing business with Cuba, continuing its reversal of Trump predecessor Barack Obama's detente with the island. "The visit shows a fresh willingness by the UK to engage with Cuba in the Diaz-Canel era," said Paul Hare, a former British ambassador to Cuba who lectures at Boston University’s Frederick S. Pardee School of Global Studies. "The UK has long seen the U.S. trade embargo as the wrong way to produce greater openness and tolerance of new ideas in Cuba," he said. "This visit means a lot because it shows the world that Cuba is a safe country and at the same time, in spite of economic and political adversities, it continues as a country of social interest," culture ministry employee Mariela Gonzalez, 42, said on the streets of Havana. The royal couple will dine with Cuba’s new president, Miguel Diaz-Canel, who succeeded Raul Castro a year ago. They first met last November on Prince Charles’ 70th birthday, when the Cuban president was visiting London. The royals' schedule through Wednesday, when they depart for the Cayman Islands, includes a tour of Havana's restored colonial district, visits to community and green energy projects, a meeting with young entrepreneurs, reviewing a parade of antique British cars, and various cultural activities. Former Royal Ballet star Carlos Acosta, who returned to his native land in 2015 to start a dance company, termed the visit "great" and said he hoped it would strengthen relations. "I was formed here and for many years I was in the UK and built my career, so these two nations are very important to me," said the world-renowned Acosta, who will take over direction of England's Birmingham Royal Ballet next year. Britain has worked through its embassies worldwide to strengthen bilateral commercial relations since a referendum three years ago to exit the European Union. British trade with Cuba was less than $100 million last year. However, some 200,000 British tourists vacation there annually. A handful of well-known British corporations have investments in Cuba through subsidiaries, for example Imperial Brands Plc, British-American Tobacco Plc and Unilever. These and other British companies may eventually become targets of lawsuits by Cuban-Americans if Washington presses ahead with a tougher stance on foreign investment. The Trump administration has threatened to activate a dormant law as soon as next month that allows American citizens to go to court against foreign companies "trafficking" in their nationalized and confiscated properties taken at the time of Cuba's 1959 Revolution.